For the upcoming launch of NASA's Radiation Belt Storm Probes, testing of the Atlas V RD180 booster engine actuator was completed last night at Cape Canaveral Air Force Station in Florida. The actuator system drives main engine steering. An engineering review board convened this morning to analyze the test results, and will make a recommendation at the Launch Readiness Review this afternoon. At this point in the analysis, there appear to be no obvious problems with the system on the Atlas V that will launch RBSP. 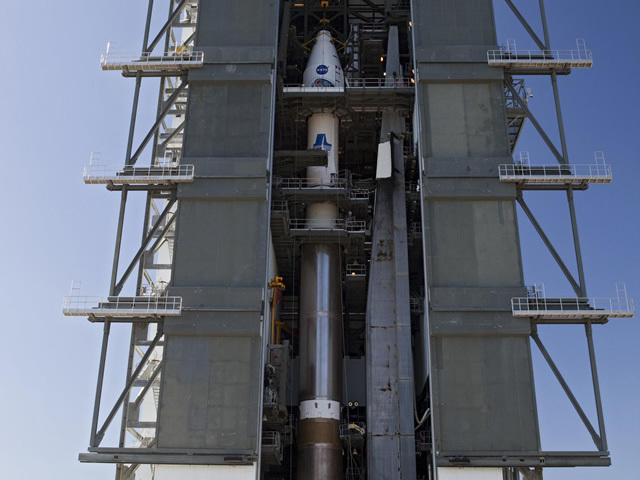 If the Launch Readiness Review has a positive outcome and the rocket is cleared for launch, rollout to the launch pad at Cape Canaveral Air Force Station's Space Launch Complex 41 will occur at 10 a.m. EDT on Wednesday morning. The RBSP spacecraft are ready for launch. The current launch weather forecast for Friday morning has only a 40 percent chance of not meeting the required weather criteria at the 4:07 a.m. liftoff time.